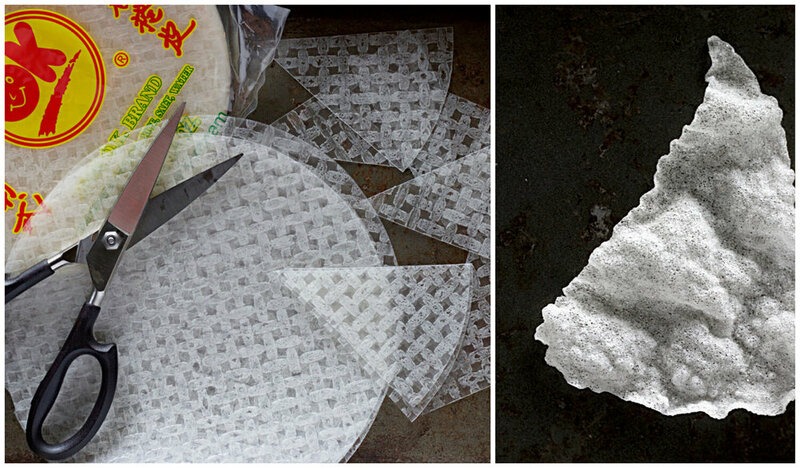 Make a full meal tonight with rice paper. You can do it. Growing up Vietnamese meant that I got to eat one of the most delicious, fresh, and affordable cuisines in the world. And there are only a handful of Vietnamese ingredients and dishes that make me miss my mother’s cooking. Outside of pho, one of my go-to ingredients is the Vietnamese rice paper wrapper. You can buy an entire pack for less than $2.00 at any Asian grocery store and it’s fairly versatile as an ingredient. Sometimes, when we’re on a no-spending day, I have to get creative when I’m craving something like chips. A few months ago, when I was feeling deprived but still wanted to satiate my cravings, I opened up my kitchen cabinets to see if there was something easy, quick, and salty that I could munch on. My desperate search led me to rice paper crisps. Vietnamese rice paper summer rolls are light and addictive. And honestly, you could put whatever you have in your fridge into these little summer rolls. It takes less than 10 minutes to pull together a full meal if you’re just making it with noodles, lettuce, eggs, and a handful of other vegetables. They’re deep-fried, crispy, and unhealthily addictive. I can’t have these fried spring rolls often but when I’m visiting home my mom will often make these for me. I used to love the smell that I’d wake up to in the morning -- my mom would be in the kitchen, rolling these tasty bites, and frying them in oil. The aroma of pork and wood ear mushrooms would fill the entire house.